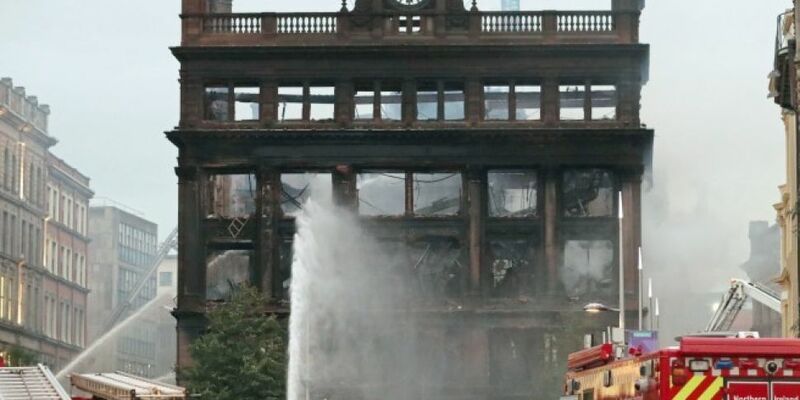 Firefighters are still at the scene of the Primark store destroyed by a fire in Belfast city centre yesterday. There are fears the historic Bank Buildings could be 'prone to collapse' after the huge blaze. Officers were concerned about the front and two sides of the historic building in the heart of the city's shopping district. The building has stood since 1787, and had recently undergone a major refurbishment. The retailer has released a statement saying it's "deeply shocked and saddened" by the event. Restrictions remain in place in the city this morning. Around 80 firefighters were deployed to tackle the blaze yesterday afternoon as the fire spread through the store, which had earlier been evacuated. Northern Ireland Fire & Rescue Service chief Gary Thompson and other officials thanked fire crew for their efforts.